Located at No. 132, Northwest Road, Urumqi, Xinjiang Regional Museum covers an area of 17,288 square meters. It features the ancient cultural relics in Xinjiang, such as stone ware, documents, jade, bronze ware, sculptures, rock paintings, frescoes, pottery, food, etc. The most attractive at the museum is the Beauty of Loulan – the oldest Tarim mummy – dating back to 4,000 years ago. At the museum, you will find several old mummies. Xinjiang Regional Museum has a collection of 32,000 pieces. It offers 3 permanent exhibitions and 3 themed exhibitions. At the Gallery for the Ancient Cultural Relics in Xinjiang, you will find around 700 pieces of cultural relics, including old coins, jade, rock paintings, frescoes, bronze, and official documents and letters, Buddhist inscriptions in various languages such Chinese, Qiuci Characters (龟兹文), Qarasahr, and Uighur. These relics reflect local characteristics. Several sand tables, rubbings, sculptures, multi-media and so on are employed to present the development of the Western Region and Xinjiang in ancient times at the gallery. The Gallery for the Revolutionary Historical Materials in Xinjiang offers a great chance to get acquainted with the development of Xinjiang in modern times – Anti- Japanese Period and the liberation, etc. At the Gallery for Ethnic Folk Customs in Xinjiang, you will feel the folk customs of the 12 ethnic minorities living in Xinjiang, such as Uighur, Hui, Mongolian, Kazak, Kyrgyz, Xibe, Tajik, Uzbek, Daur, Manchu, Tatar, and Russian. In the main exhibition hall of the Uyghur dwellings, three distinctive Kazakh, Kirgiz and Mongolian yurts stand there. In addition, you could find a variety of animal specimens at the gallery. At the Gallery for the Ancient Mummies in Xinjiang, the Beauty of Loulan lies with well-preserved skin and body. Several mummies with a history of more than 2000 at least discovered in Xinjiang are accompanied with exquisite funeral items. Most of the mummies are dressed with great make-up. The old costumes featuring the Western Region’s characteristics from the Pre-Qin Dynasty Period through the Western Jin Dynasty (266 - 316) to the Qing Dynasty (1644 - 1912) are on display at the museum as well. 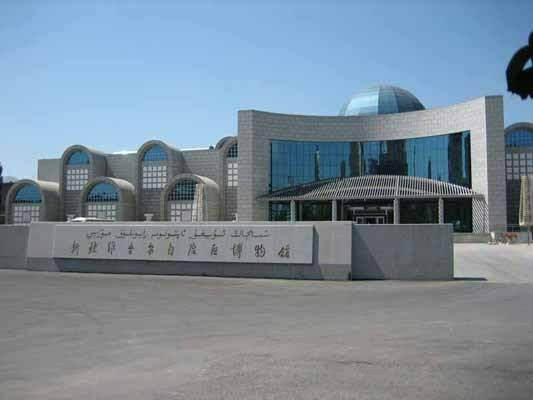 The best time to visit Xinjiang Regional Museum is in the morning during the opening hours. Several buses pass by Xinjiang Regional Museum. Therefore, there are several options. Rent a vehicle to the museum. This is the quickest and most direct option. Take Bus 7, 51, 52, 66, 68, 303, 305, 309, 311, 518, 906, 910, 912 and Bus 928 to the Stop of Bowugguan (博物馆站). Tourists can visit the museum for free. Please get the entrance ticket at the ticket office with your passport. It is not allowed to take water into the museum. Only 2,000 visitors are allowed to visit the museum for one day. Interested in visiting the Xinjiang Regional Museum on a Tour? Wendy Wei Tours offers a variety of different packaged tours as well as custom tours including the Xinjiang Regional Museum, among other attractions and destinations. To find out more, please visit our Tours page or Contact Us directly to find out more.